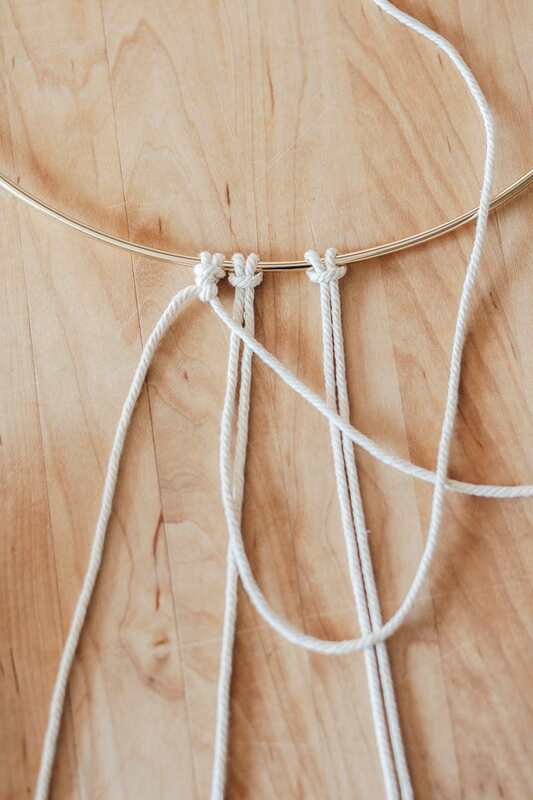 Learn how to make basic macrame knots with this step by step guide. 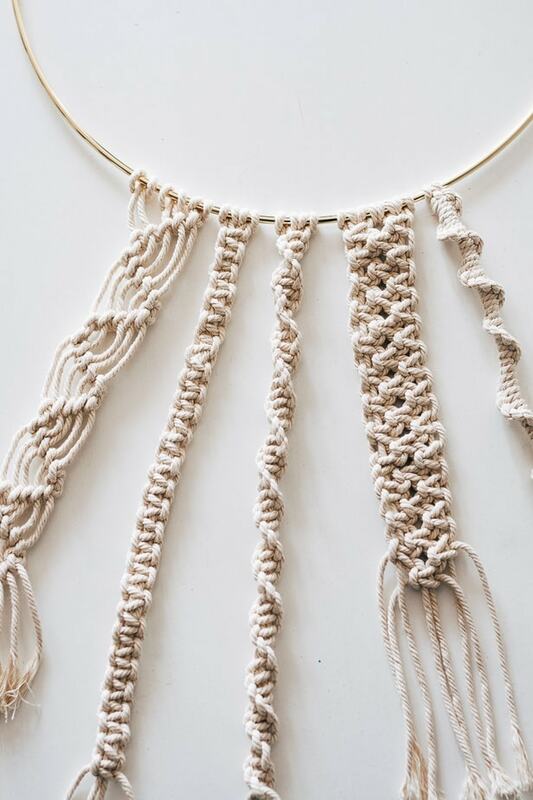 Includes a handy macrame knots pdf that you can print out for your next macrame project! Are you feeling totally overwhelmed by Macrame? Your Macrame worries are over. Today I’m helping you take that first step. 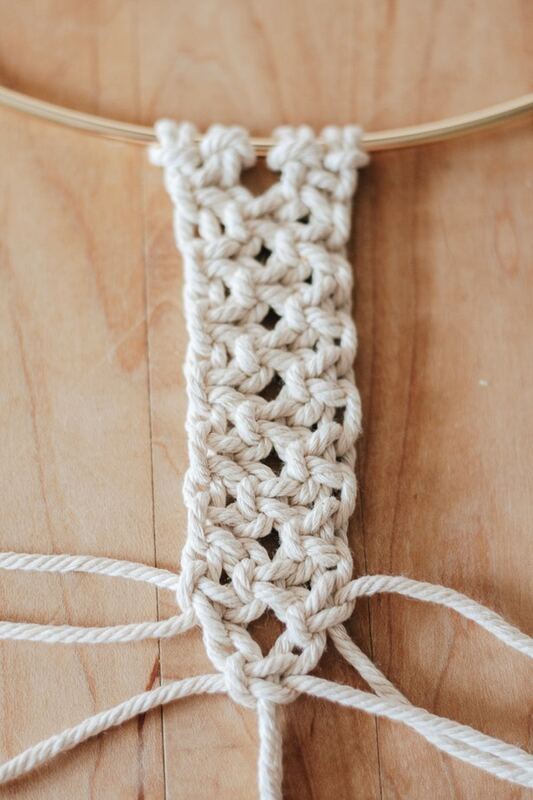 Because here’s the great thing about macrame: Even the most basic macrame knots can make drop dead gorgeous patterns. 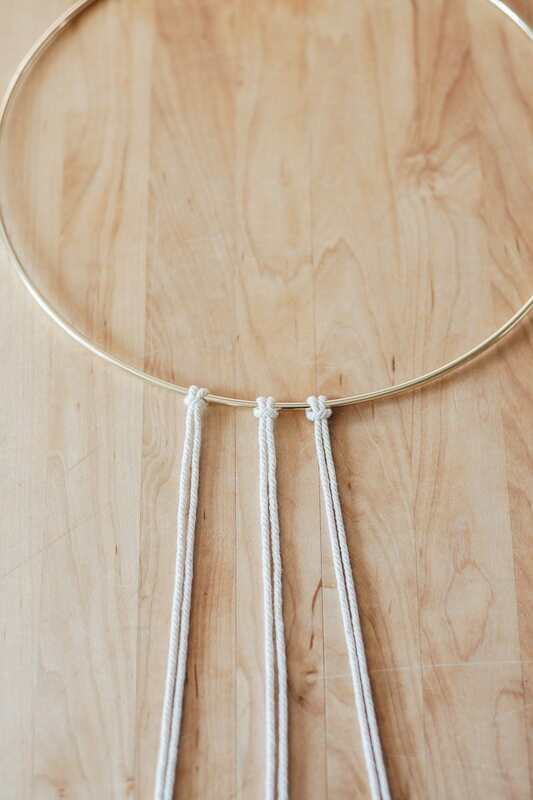 Just check out these macrame projects for the beginner. Amazing, right? 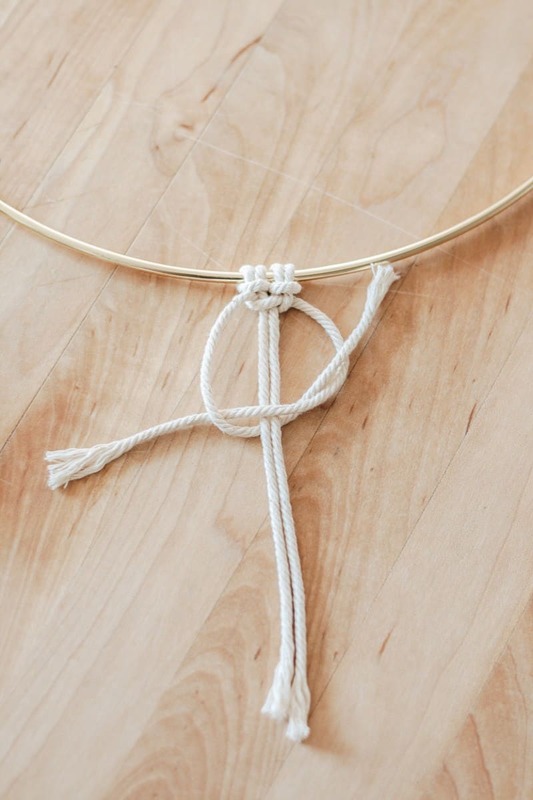 If you can tie a knot, you can macrame. 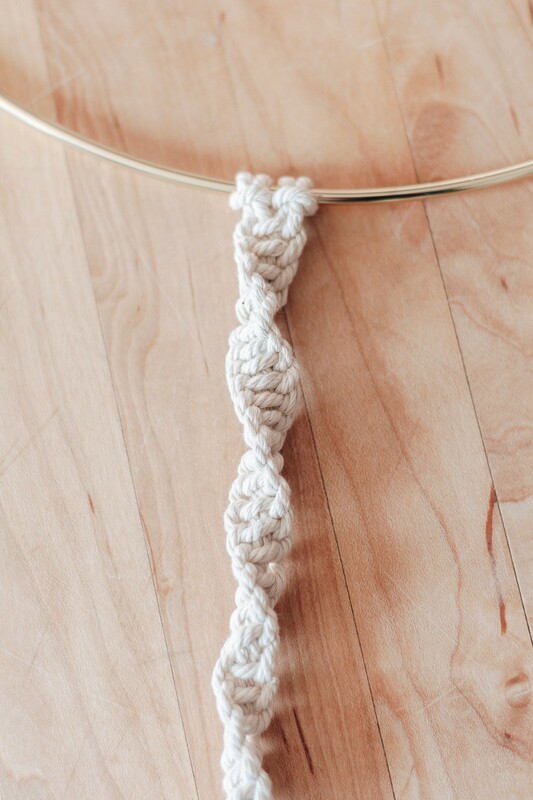 UPDATE : I’ve included a handy macrame knots pdf that you can download and print out for your next Macrame project. Go to the bottom of the post for the download to the pdf. Below are four basic knots to get you started. 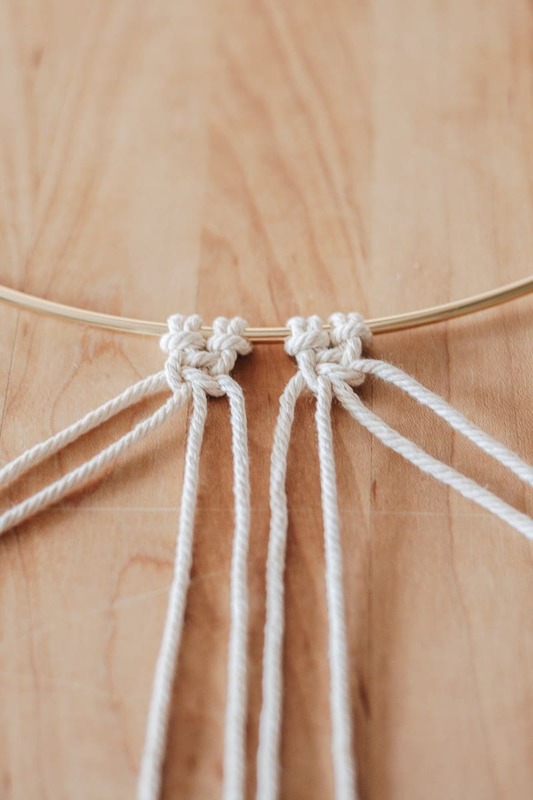 You can make so many things with just these basic knots under your belt. Keychains, bookmarks, placemats, macrame bracelets, macrame knot wall hangings, plant and jar hangers etc. So first we need to go grab some Macrame cord. 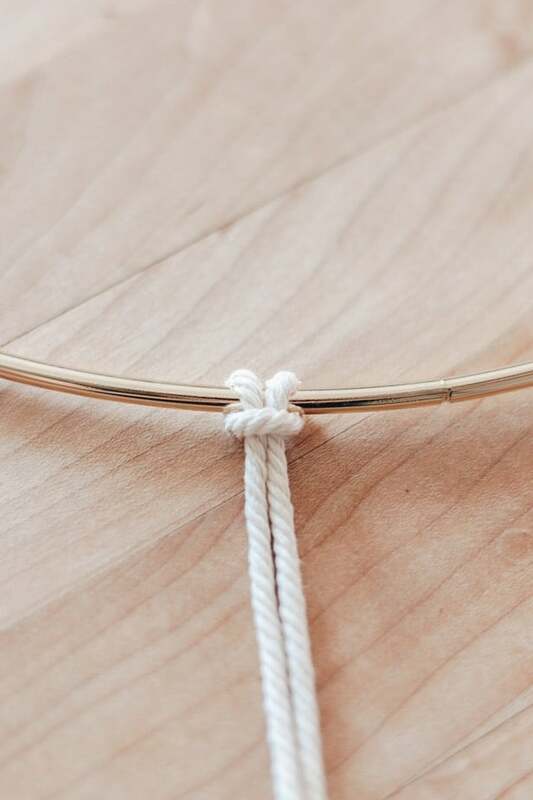 I like this cording. Plus, it’s inexpensive. But Amazon has TONS of options for good macrame cording. And don’t forget that you can get all sorts of colors too. Read the reviews and find what works for you. Then, we need to get a hoop, a stick or a ring. Something like this to attach your cord to. Here’s a whole set for you if you want to get it all at once. Here’s the gold ring I used. I had these rings leftover from my hoop wreath project. We are making progress already. The Lark’s head Knot is one of the most basic knots in Macrame. 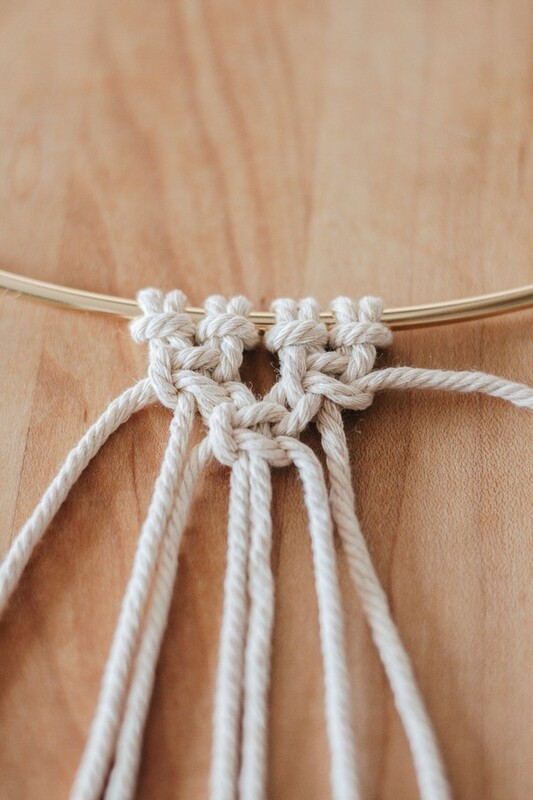 In fact, almost every beautiful piece of finished macrame you see starts with this knot. 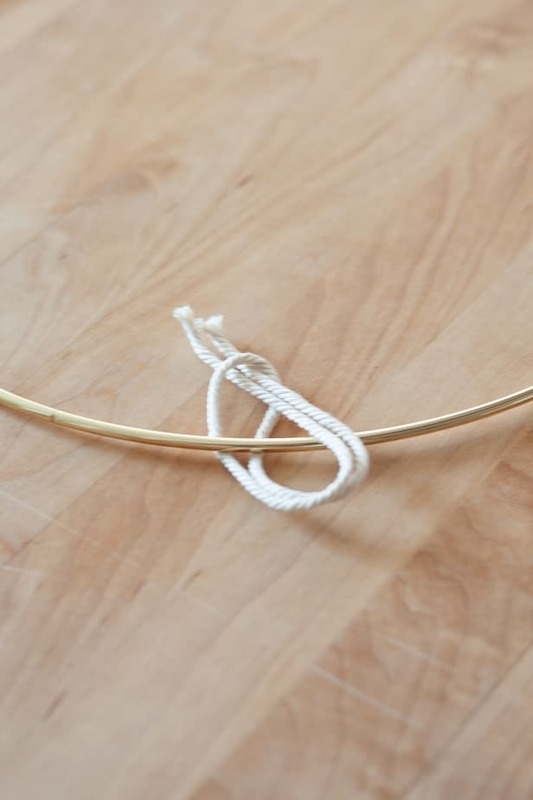 The Lark’s head knot is used to attach your cording to your ring, dowel or handle when starting a macrame project. 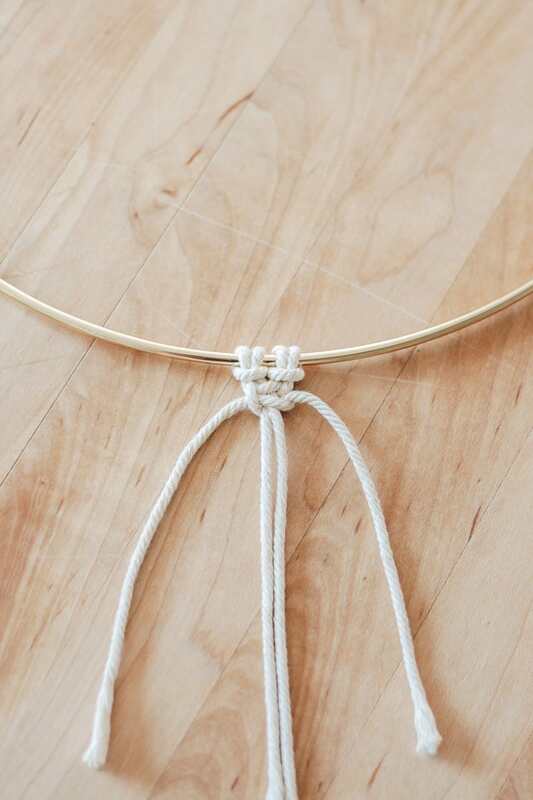 Start by folding your piece of macrame cord in half. See that little loop? 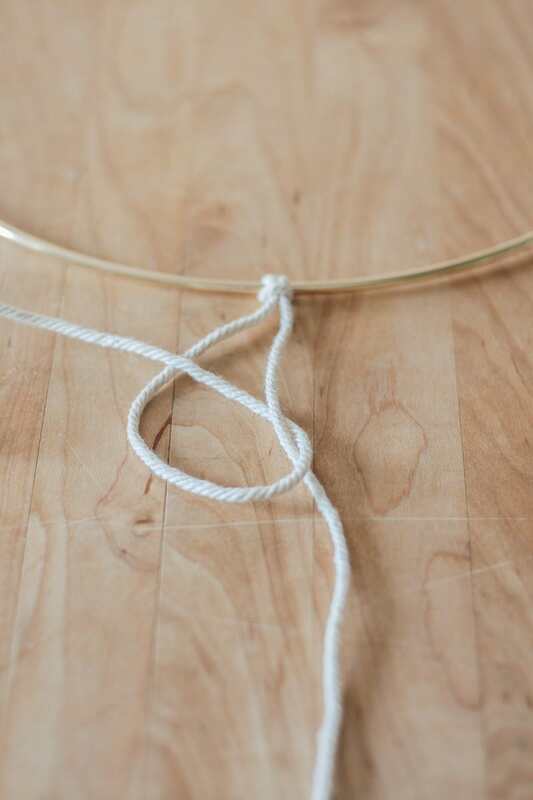 Place that loop under your ring or dowel. Now fish the ends of the cording through that loop. Pull tight and you have your lark’s head knot! 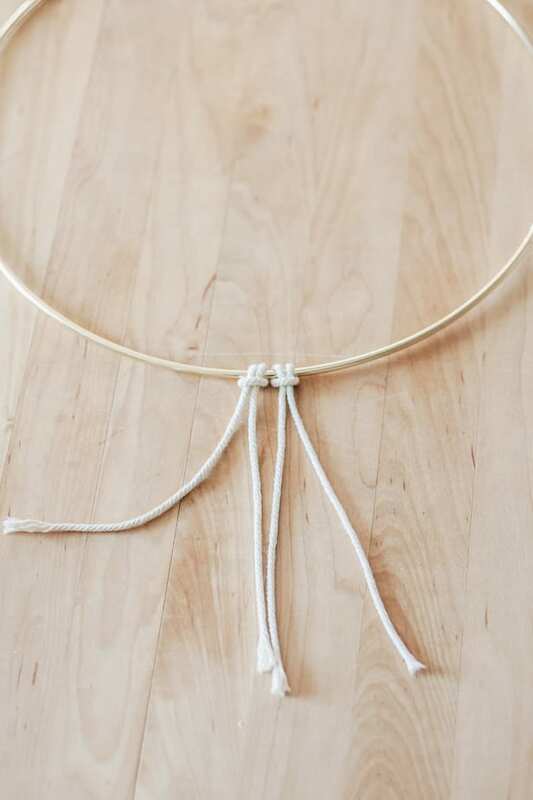 By the way – check out this really easy and cute diy macrame knot wall hanging with beads using JUST the lark’s head knot. To make a reverse lark’s head knot – you simply do a lark’s head knot the opposite way. OR – just flip your project around to the back. There are essentially two parts to the square knot. You have to complete one side (also called a half square knot) and then the other side (also called a right half square knot) to make the full square knot. Start with two Lark’s head Knots. There should be a total of 4 macrame cords there. We are going to take the outer left cord and cross it over the two middle cords. Now take the outer right cord and place it on top of the left cord and UNDER the two middle cords. Loop it through the hole on the left side. Now pull tight without letting your cords twist. Yay! You now have ONE side of your square knot done. You have now completed a half square knot. You should still see your 4 cords there – got it? Good. Take the outer RIGHT cord and cross it over the two middle cords. Take the outer left cord and place it on top of the left cord and UNDER the two middle cords. Loop it through the hole on the right side. Now pull your cords tight. Your Right Half Square Knot is complete. You have completed the full square knot. When you repeat this knot over and over again (in rows or sinnets) – you end up with a beautiful pattern of tightly weaved or netted cording. This photo below is an alternating square knot. This is more of a wider pattern. I love alternating square knots with even spacing in between the knots. To make the alternating square knot like I did above, start with 4 Lark’s head knots (there will be 8 total cords). 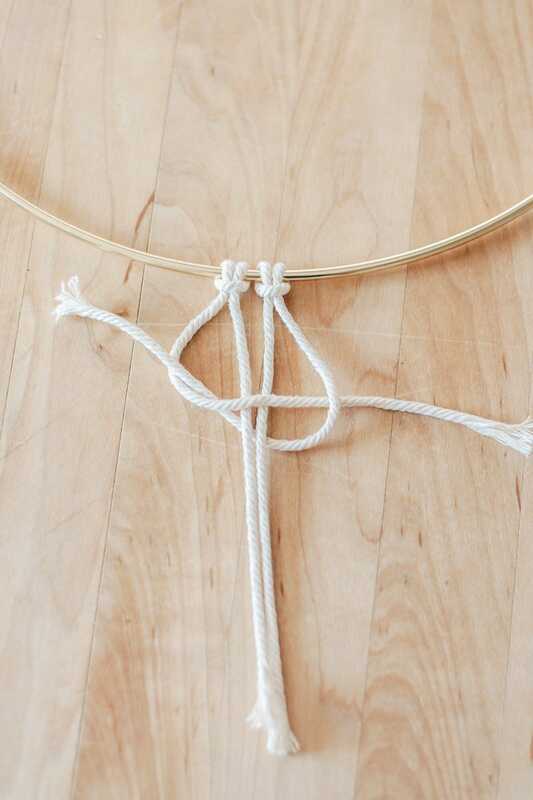 Make a square knot with four left side cords. Make a square knot with the four right side cords. Continue working this pattern, left, right, middle, left, right, middle. Make sure to pull your cords tight without any twisting. Start with a Lark’s head knot. Take one cord and make a number 4. 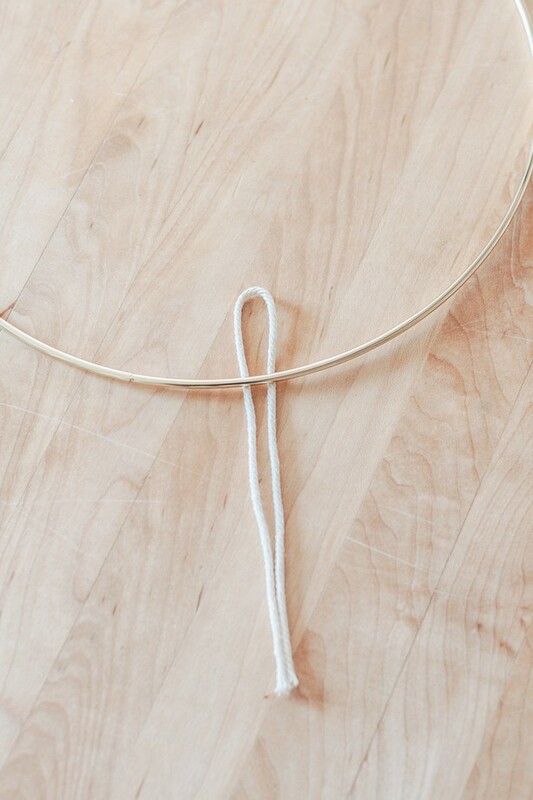 Loop that cord through the “4” hole and pull tight. You made a half hitch knot! A double half hitch knot is just a half hitch knot repeated a second time. Make another number 4 using the same cord you used before. Loop it through the hole of the “4” and pull tight. Start with 3 or more Lark’s head knots. For this example – we are using 3 Lark’s Head knots. There is a total of 6 cords. Take the outer left cord and place it diagonally across all the other 5 cords. This cord is your filler cord. The direction and placement of this outer left cord will determine it’s pattern. So just make sure it’s placed the way you want over your cords. Working left to right, make a double half hitch knot with the second cord. Pull your cord tight. Ensure your outer left cord is still placed diagonally over the cords. Now make a double half hitch knot with the third cord. Now make a double half hitch knot with the fourth cord. And keep going until you reach the last cord on the right side. You will see your diagonal pattern of knots. Now, you are going to repeat steps 2-7 but this time working right to left. So place the outer right cord diagonally over the other cords. You can also make a horizontal line of double half hitch knots (just go horizontal instead of diagonal with that first cord). 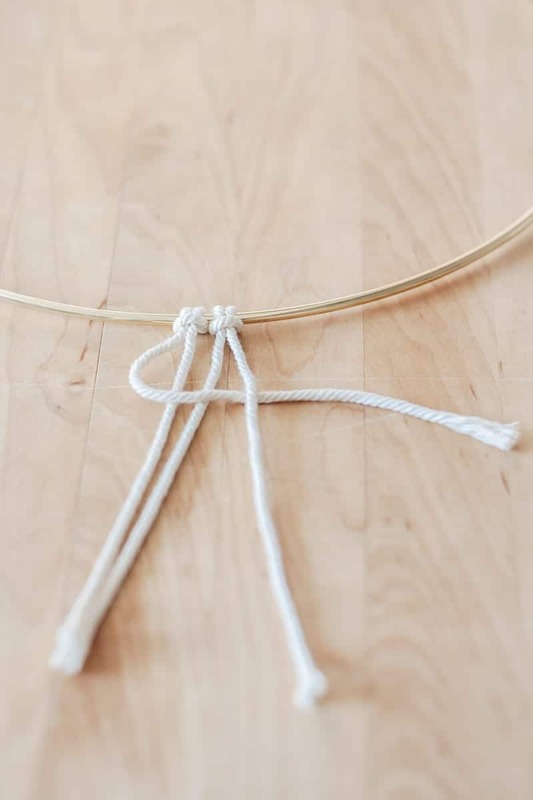 There are variations to the half hitch knots, (like triple half hitch knots), but even with these basic half hitch knots you can make great patterns. I think the Spiral knot is one of the prettiest knots. And fortunately – it’s one of the easiest too. You already know how to do the spiral knot. It’s just a repeat pattern of half square knots (first half of a square knot) or half hitch knots. Instead of switching to the right side to complete the square knot, you just keep working that left side. The macrame will naturally spiral. Just go with it. To make a thicker version of the spiral knot, start with 2 Larkhead knots. 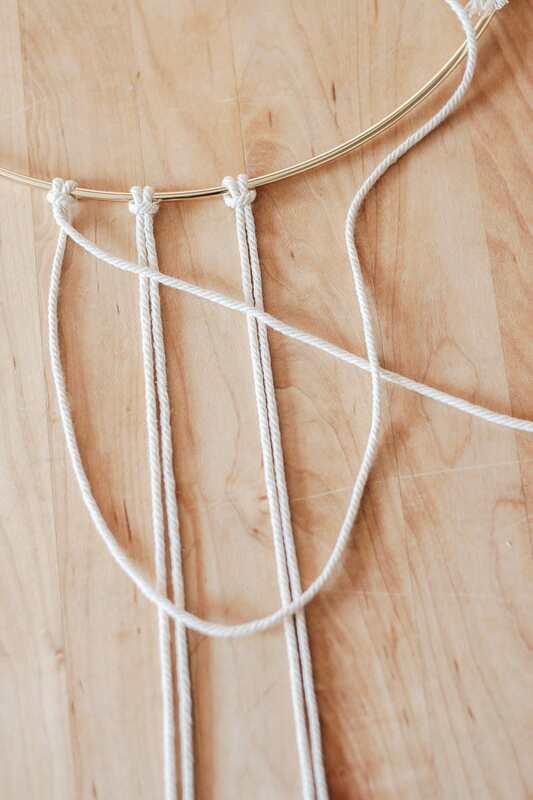 To make single version – start with 1 Larkhead knot and make a repeat pattern of half hitch knots. 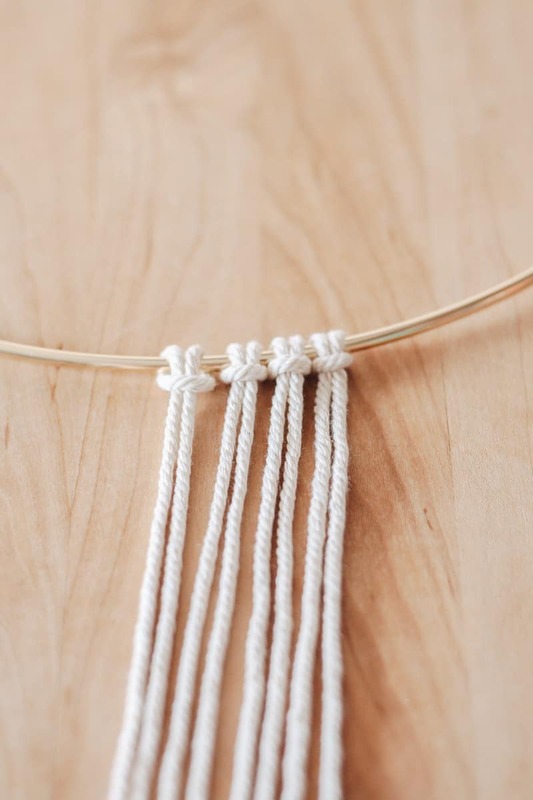 Again – your macrame will naturally start to twist. This is the pattern on the far right below. The trickiest part of this knot, is keeping the pattern going the right way when it starts to twist. Ok guys – you did it! You’re awesome! Pat yourself on the back! Look at your beautiful patterns. Aren’t you super impressed? PS: I sat in front of the TV and finished these knots up last night after the kids were in bed. My husband asked me if I was making him a giant friendship bracelet. LOL. Here’s the link to your handy macrame knot pdf print out. I’ve also added this to my subscriber library – so if you are a subscriber, you can just download it from there. Not a subscriber? Well, just click on the button below and you’ll be all set! And thank you! I love this activity so much. I can totally understand how people get hooked on Macrame. 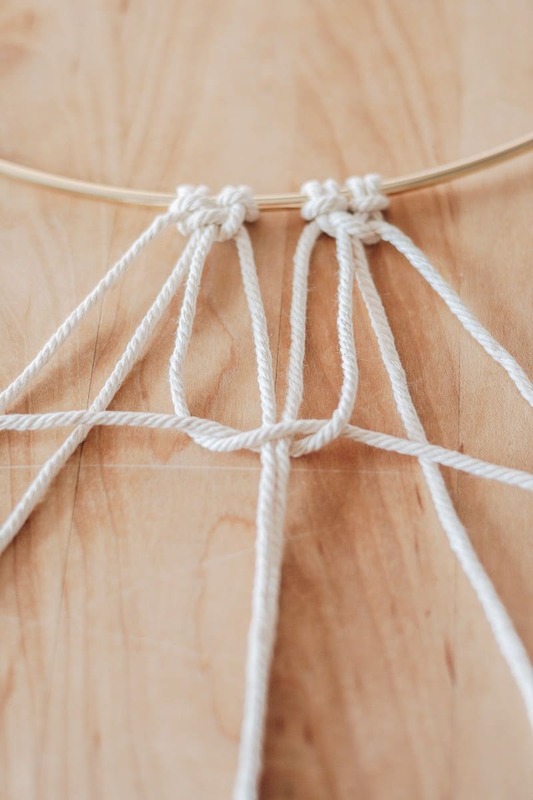 By the way – if you are looking for a really easy but cool macrame project, you should try these diy macrame jar hangers you can make in 5 minutes. I finally understand. It actually worked! Yea! So glad this worked for you! Macrame is so fun once you get the hang of it! Hi Firdos – That’s a great question! A good rule of thumb for determining the length of your cord is to just make it double or (2.5x) the length of your finished macrame piece. 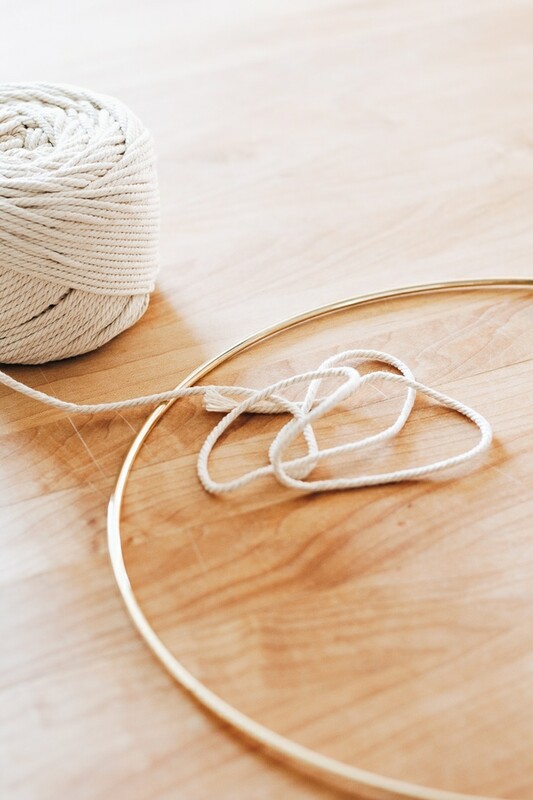 For example – if you want a 12 inch finished piece – start with at least a 24 inch or 30 inch piece of cord. Hope that helps! 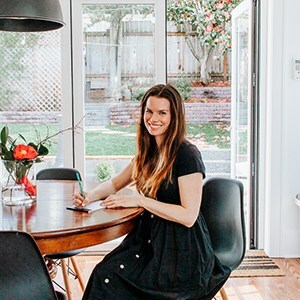 Enjoy reconnecting with this great craft! I saw a pattern for a carousel with horses and it went around and it was really great. Do you know if there’s such a pattern around now, and how would I be able to go about getting one? 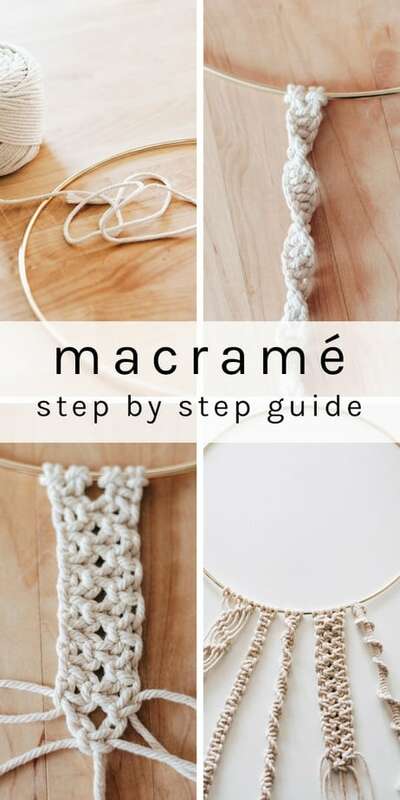 Thank You for any help you can give me and I have shared your Macrame Site on my site hope you get a lot of hits from that. Hi Margaret – it all depends on what you are trying to make. It’s always better to have too much cord than too little! I would go with a length at least four times larger then the finished project. Thank you Sheila! I’m so glad my tutorial helped you. 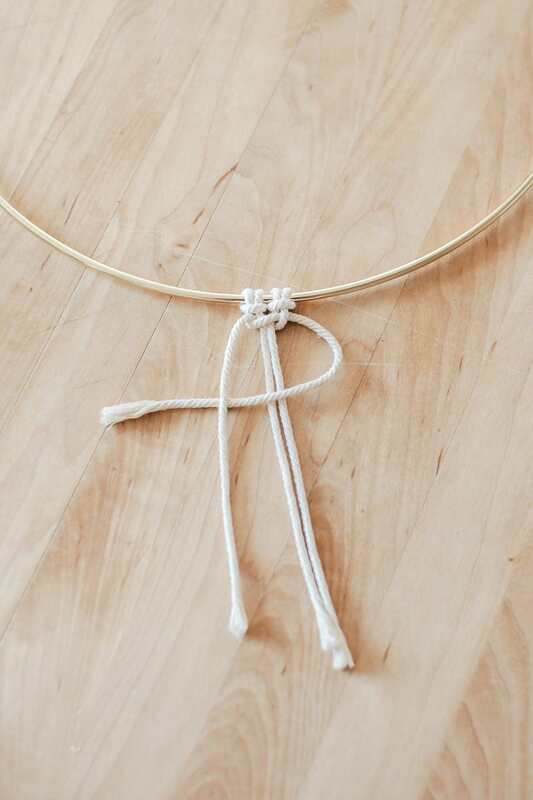 Macrame is so fun! Thank you, Karen! I came here for the knot that’s on the right in the main photo. What is that knot called? It’s perfect for what I’m trying to do for a plant hanger. Hi. I learned how to do this in highschool but its been a few decades. I forgot how to do it all. Thanks. I think i can pick it up again easily now. So great to hear! Thank you Surendra!